Fifth in the Victorian Pincushion Series..
#167WRP - Wool Roving Pack- contains 1 yard of pure wool roving to fill your pincushion with. #167ZSK - FULL Student Kit - So convenient..! 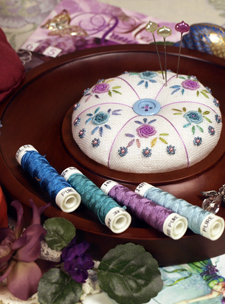 This complete contains All the materials you need to finish the entire pincushion. 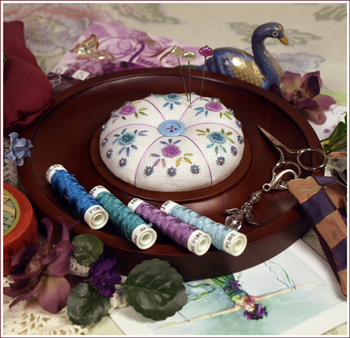 You will get a full colour leaflet, Acc Pack with threads and beads, Linen Pack, Wool Roving Pack to fill your pincushion with natural wool to keep your needles bright and sharp, and a Wooden Pincushion Tray as pictured below. Sorting The Threads in your Accessory Pack: Remember to sort in daylight near a window, not under artificial light indoors, as the colours change with the colour of the lightbulbs we use. Each floss has a different number of strands in each thread length. This helps you differentiate the different colours in your pack. Caron Wildflowers and #4 Braid are used 'as is'. 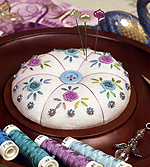 Needlepoint Inc. silk floss has 8 strands per length The Kreinik Mori has 6 strands per length. We hope this extra information will help you sort your threads more easily!